In recent blogs we’ve discussed the value of using dynamic content to create highly personalized offers to drive greater response. Indeed, the value of using dynamic content to create one-to-one messaging, rotate champion packages and challenge current champions through multivariate testing is extremely high. But it also creates a significant need for a dynamic content management (DCM) solution that helps marketers manage all their creative packages as they expand the scope of their personalized messaging. To fully appreciate the complexity of managing dynamic content, it’s important to understand the difference between variable content and truly dynamic content from a design and production perspective. Variable content is typically the jumping off point as marketers begin to create personalized offers. When using variable content, the layout includes fixed “landing zone” configurations that incorporate static elements, such as images, text snippets or logos. While each offer is personalized to a certain degree, it’s not truly personalized for each individual recipient. In contrast, the “landing zones” for layouts utilizing dynamic content represent regions of the page, not specific content types. This requires more planning and customer controls based on defined business rules. It also involves the use of wireframes to guide the placement of all elements across all versions, campaigns, and product lines. Having an effective DCM solution is extremely important when moving to a digital platform. It’s the most effective way of managing the content across all versions, allowing marketers to make a change to content or an asset in one location and have it span all creative packages. A good DCM has the proper workflow and technology in place to reduce risk and compliance errors, improve change management and increase speed to market while being scalable to accommodate multiple layouts in a single system and print stream. It also allows for a locked reuse environment ensuring that no unintended changes are made. IWCO Direct’s Content Manager uses demographic, geographic, psychographic, and behavioristic data to logically select images, messaging, and layouts and combine them into numerous targeted versions of a single marketing piece. Our supporting technology automates content accuracy to provide quality assurance. All technology is supported by the IWCO Direct Technical Marketing Services team where members have years of experience in execution, optimization and training specific to DCM. 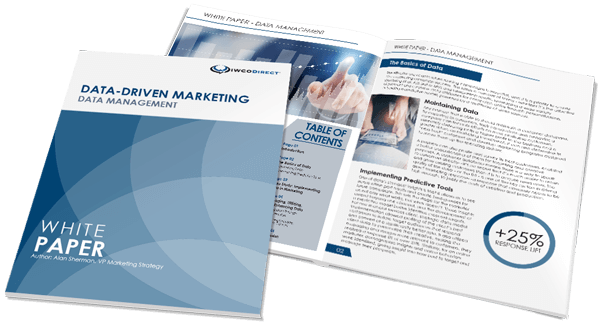 Our DCM is a single interface that allows for real-time proofing, integrates with multi-channel marketing campaigns and is backed by our data security standards. If you’d like to learn more about it, please let me know or contact your account team.